She gave me a perplexed look and no doubt wondered how I had managed to survive all these years without knowing how to transform a live bird into a feast for my family. But she graciously took the knife, did the dirty deed, and walked me through the steps of cleaning, plucking, and finally cooking the bird in her wood-fire oven. Earlier that day Eloisa had invited my family over for lunch and I wasn’t surprised at the invitation. We had just bought our farm in Ecuador’s Intag Valley and the hospitality of the Ecuadorian people is legendary. So a warm welcome from the locals was not a shock. 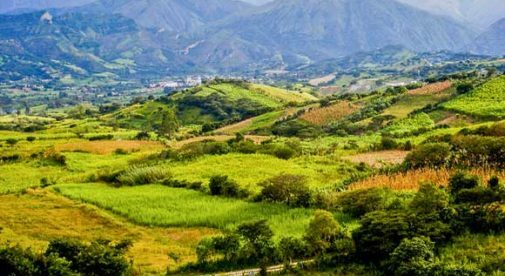 What I forgot to take into account was that we were now deep in el campo (the countryside) and campesinos are a self-sufficient lot, accustomed to solving any issue themselves…including growing, raising, and preparing every last morsel they eat. And of course, they just assumed that my lifestyle was the same. Luckily, this is not typically how my days in Ecuador go. You see, most of my time is spent in the highland town of Cotacachi. And while the town is small and surrounded by beautiful countryside, we have wonderful food-buying options there. At the mercado I can buy a whole chicken (already dead and free of feathers) for between $5 and $8, depending on size. If I want only breasts or thighs I can head over to the small grocery store chain to buy those already cut and packaged up. Or I can order ground chicken, smoked whole chickens, or chicken cilantro sausage from a small nearby farm that produces artisan meat products. 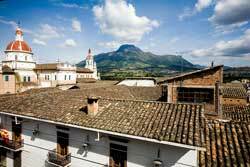 Whether you’re eating in or out, the mountain town of Cotacachi has everything you need for the perfect, low-cost meal. There’s a lot more on offer than just chicken too. My family loves fruits and vegetables so we spend quite a lot of money at the produce market, but far less than we ever did back in the U.S. I spend $10 there about three times a week in an effort to keep us stocked up on fresh fruit for snacks, veggies for stir-fry and ratatouille, and fixings for guacamole and salsa. And if I prefer to eat something prepared by someone else, I’ve got great options in my little town as well. I can pop into my favorite empanada haunt and fill up on empanadas—the ones stuffed with chicken and vegetables are my weakness—for $1.80. If I want to go high-end, I head over to a family-owned bistro where I get lasagna served with home-made herb bread and a pesto-topped salad for under $10. When spending time out at our farm, I’ve learned to come prepared. I shop in Cotacachi, load up my cooler with food, and truck it out to Intag. As for the live-chicken incident…well, I just chalk that up to another one of the great stories I have to tell about life in Ecuador.